I was back in business the next day thinking I will finally finish the machine quilting part of this quilt so I can move on to some Fall/Winter hand quilting. I was wrong :) Another day another wrinkle, grrr This quilt has been throw aside for now. Sewing and swearing is not what I want to do!!! To get my sewing mojo back I decided to make a frozen dress for Abigail's new Samantha doll. This is but one of many patterns I have collecting dust in the sewing room. I pulled out leftover fabric from a Frozen project I did for out little girls last year excited to rock a frozen Samantha dress. What the heck was I thinking!!!! I really have to be in the mood for doll dress making. So many tiny pieces, and the fabric frayed like crazy!! I had to go back over every single seam with top stitching, not what I had in mind!!! I am using DD#1 original Samantha doll as my model....I am now wondering if the new American dolls are a bit slimmer than the originals from the 1980's? This dress is tight!!!! As we say in the South "skin on bologna tight". I do know from sewing experience the new Bitty Baby has a fuller body than the 1980's Bitty. I may or may not have time today to do some alterations to the dress so Samantha can breath and move. I also need to make her cape. While I was out and about Christmas shopping with DD#3 yesterday I found a knock off brand of shoes that fit the American dolls. The crown is a leftover hair pretty from Kara's Birthday Goodie bags. Yaa it works!! I feel it's OK to share the families address (see photo below) on this blog because they have shared it on an open page on FB. Tiffany's Journey. Now that Tiffany has passed I'm not sure how long they will be keeping the page active. The Go fund me account is still active I believe as they are still working to pay for Tiffany's headstone. Off this morning for some toddler soccer, need to make a Halloween desert for the little's, and I have a feeling hubby's new costume might need some expansion!!! Last week before all heck broke loose I went on a field trip looking for backing. Before I went on my fabric adventure I pulled the border and binding fabric from my stash, money saved. I can't remember how long it has been since I pieced this Irish Chain quilt. After I added the double borders the quilt grew to king size. What was I thinking!!!! Is this not the sweetest thing ever? Our grands don't mind loving on each other wherever they go. It's not unusual to see them walking hand in hand or arms wrapped around each other. Don't get me wrong... there are days when one or more might be in the mood for a knock down fight but for the most part they LOVE each other to the moon and back. Saturday mornings are devoted to toddler Soccer. Mason man is an animal on the Soccer field. We also had a make up Football game on Saturday. We all kept the roads hot!!! Ditto for Sunday. Mommy and Karsyn enjoyed their girl time morning. Karsyn was thrilled with her Birthday shopping spree!! She was careful to ask "What does dis costs" knowing some things were WAY out of our price range!!!! She stayed within budget something her Mommy and I were hard pressed to do I can tell you :) We wanted it all!!!! The craziness has not ended. Tyler has been with me the past few days suffering from strep throat. Three out of five grands so far have been infected. No doubt the last two kiddos will be next. I have a big girls weekend coming up next week. You can bet I have been disinfecting this house with essential oils 24/7!!!! With all this family fun came some heartbreaking news. Yet another one of Elijah's friends took her first breath in Heaven October 19 at 11:11 PM. Tiffany left behind oodles of friends and family along with a little Sister who is only eight years old. I just happened to be on FB that night when the news was posted. My very first thought was of Abigail her little Sister. How in the world can a heart so young be healed. 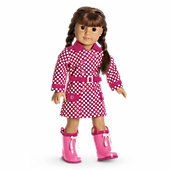 Immediately "Samantha" one of the original American Girl dolls came into my heart. What the HECK!!!!! Dear crazy mind of mine what's up with that? 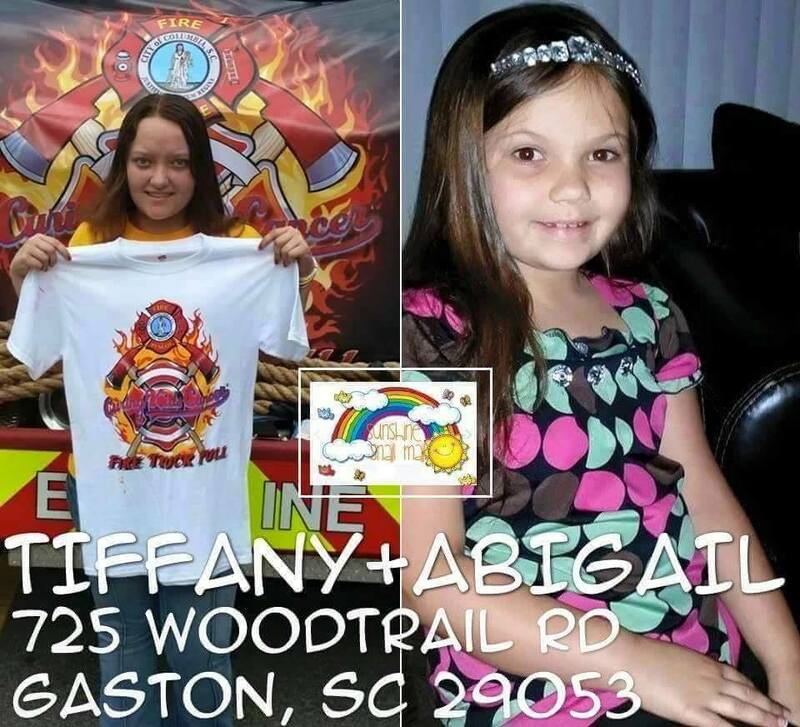 My prayers that night were for Tiffany's family, her little Sister and so many other families who are battling this nasty stuff. I ended the night with a little chat with the Lord, what in the world...why can't I get that stinkin doll for Abigail out of my mind and off of my heart? How shallow am I that I feel deep in my gut a durn doll can make it all better? My entire trip to the American Girl shop on Sunday was spent questioning myself over that doll for a broken hearted little girl. I finally gave in and ask DD#1 what doll would be good for Abigail, I can't get her off my mind? Should we do a build your own doll and name her Abigail or go with one of the regular dolls? Immediately she said "Samantha"...cold chills. Lord is that you talking to me? Tiffany's family are not wealthy. For a week I wrestled with this crazy frivolous gift on my heart. 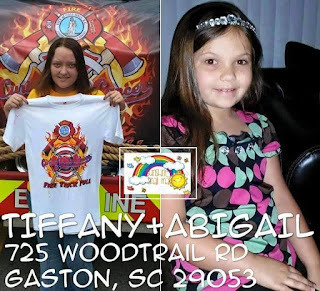 The practical thing to do for Tiffany's family would have been to make another donation to her Go Fund Me account, this time to cover the costs of her burial. Monday morning one week after Tiffany's passing I ordered "Samantha" to be expressed shipped to Abigail. Hubby questioned what's a doll without clothes, I thought half the fun was dressing those things up. My main man is so smart sometimes on rare occasions he's even right :) It was cold and rainy here Monday morning. A girl needs a good rain coat right? Seeing as how it was on sale I knew I didn't go wrong!! So this is a LONG story and post....I think what I am trying to say is God speaks to us in nutty ways sometimes. After lots of prayer, being quite so I can really hear what he is saying we best be doing what he puts on our heart. Since receiving her doll Abigail's family has shared with me CORE CHILLING stories of why this doll was PERFECT. I can tell you after hitting that submit button I felt like the weight of the world was lifted off my shoulders. Now I know why. Will this doll heal a broken heart? Will this doll replace a Sister that fought so hard for her life? Will this doll bring her big Sister back? Of course not. But the day Abigail opened her surprise box her day was just a little brighter, that's good enough for me. Using the sew in stabilizer worked like a charm while stitching down all the little pieces of fabric on my Halloween runner. If there is ever a "next one" I know to use a darker orange thread on the pumpkins as the matching thread doesn't show the detail stitching. It's been a good two days of play!!! I really needed to get some things out of the mounds of UFO's in the sewing room and I needed to do something for ME for a change!! I dug around in my quilt top piles before bed last night to decide what quilt I wanted to work on next....I found two. However they both need borders added as well as backing. I think I have enough border fabric for one the other is going to be a problem as I can't remember where I purchased the fabric from. I will be making a trip to the fabric store today. Focus, I must focus, don't purchase anything other than backing fabric!!!! My goal for the day is to add borders to the next quilt, get the backing done, then sandwich the quilt. Starting tomorrow I will have one or more of the kiddo's until next Tuesday. There won't be much time for quilting!! The other must do is a little house cleaning as that won't be happening with the grands around. Some meal planning is also in order. We have a bunch of activities going on with the little kiddo's. I want to avoid eating on the run as much as possible with Christmas just around the corner it's time to start pinching pennies. Speaking of Christmas has anyone started their shopping? I finally have all of the out of town family and friends gifts purchased but that's it. I have a few things for hubby put back and a small list going of things for the big and little kids. I need to get busy soon but for now I just want to enjoy this fall season!! I realized the photo of the pair of Witch shoes I posted yesterday didn't show the stitch design. Sometimes you need to go with quick and easy :) The pattern I am using called for a patchwork border....Seeing as how I had this really cute fabric with no plans on where to use it I went with this easy option. One place the is no corner cutting is fusing all these little applique pieces. Three hours later it was finally time to start laying out and ironing everything down. Talk about time consuming!!!! Late this afternoon I was finally ready to begin machine applique on the runner. After all the cutting of wonder under and fabric I didn't get very far but a start is better than nothing!! Tomorrow I will be ready to rock this baby. This evening AJ the Beagle and I FINALLY finished hand quilting the quilt I have been dragging around for longer than I can remember. It feels so nice to get one more To Do out of the pile of projects. Once I covered the Beagle up with the finished quilt I came so close to digging around in the pile of completed quilt tops. NO!!!!! OK, well maybe :) Once I get MY table runner finished I just might begin machine quilting. More than likely another quilt will have to be put off until next week as the calendar is pretty full with activities for the Grands. Field trips, Teacher work days, Soccer, Football, and a Birthday party will be taking up most of our time starting Thursday. Keeping life in balance is always a struggle. Lots of Lollipop toppers are ready for upcoming Pre School parties. Still waiting to find out if Tyler and Kara's schools will be needing any for their parties. A few of sets of Oreo Witch shoes are completed. For the life of me I can't get the stickin cookies to stand up nicely. I think I will be checking out the dollar store for a pair of socks to stuff instead of cookies. Have you seen the price of Oreo's these days? Holy cow!!! It takes 20 cookies to make a pair of Witch Shoes. Little boys just crack me up. As the Mother of three girls everything these little guys do is new territory for hubby and I. Mason man was so fascinated with the pumpkins that were busted open showing the "guts and bugs" that he had a hard time focusing on the perfect pumpkin. Monkey see, monkey do!! It didn't take long for Blake to follow in Mason Man's footsteps, he too wanted to find "Guts and bugs"
Toddler soccer game, pumpkin patch, family dinner, followed by some Bama football all in one day....this schedule ain't for sissy's!!! Today is a much needed quite day. All that is on the calendar for today is Tyler's afternoon Flag Football game. Mornings home without ripping and running are so nice. Hubby had a breakfast ride with his buddies...me...I had ZERO to do. Just me and the Beagle enjoying a quite cool fall morning. While my furry sidekick napped under a quilt I packed up three boxes of gifts that need to go in the mail in the morning. That makes today a double nice day!! Boxes going in the mail right on time, no need to pay extra for priority shipping. Go Me!! This afternoon I am enjoying some time off my feet sewing embellishment's on all the Witch shoes. I have hopes of finishing DD#1's Halloween ornaments today as well so they will be ready for the little's to decorate their tree this week. If the grands will cooperate this week I might get two full days of some ME time. In other words some sewing for myself for a change :) I have already lugged the regular sewing machine downstairs. I'm itching to organize my "for me" sewing project but sure as I drag it all out one of the buggers will spike a fever overnight. Is anyone else marking off some Fun To Do's for Fall list during this cold snap? I am trying to get a little ahead of the game in the gift giving department. The big kids always hit me up for some last minute gifts for teachers and such during the fall/winter holidays. I still haven't had the time to get the software installed for my embroidery machine but I figured out a work around for now. Once I got started on this years small gift giving item I realized my embroidery scissors had seen better days. As luck would have it they were 50% off this week at Hancock's fabric store, that's a BIG help on the budget!! One of today's many must do's is filling five Christmas Child's shoe boxes for Bikers For Kids event this weekend. Nothing better than some last minute jobs that throws a monkey wrench in the already overload schedule. Hubby and I had taken Mason and Karsyn shopping for their shoe boxes on Sunday, sure wish I could have done everything at one time!! Once I get today's To Do's complete I plan on going to bed super early with a good book along with a few essential oils tonight. I need to get some extra sleep and healing!!!! AJ the Beagle and I finished the animal cuddle blankets this week. One garbage bag full has been delivered, two more to go. I lost count of the blankets at 57, that was a whole lot of cutting and tie I can tell you!!! I now have FOUR empty laundry baskets, go me!!!!! Wednesday was my "Day Off" Hubby and I enjoyed a nice breakfast out before he had to go on a quick trip out of town.....what to do with the rest of the day and evening alone? Well I started with deciding on sewing projects I would like to do for Fall and Christmas this year. One thing always leads to another of course. After landing on my SEW want to do projects I pulled out fabric, batting, embroidery machine supplies, and the machine itself. It's been so long since I have had any fabric play I figured I would start with some small, easy, fun things. I wasn't crazy about the fabrics I had for one of the Christmas items I wanted to get started on but I was going to "Make Do" That was until.......I found a GC that was going to expire on 10/9, only 2 days away!!!! It was a GC from DD#2 she had given me for my Birthday Last year! Two new CD's full of holiday embroidery designs. A little bit of fabric, and a quilting book that has been on my wish list for a long time. I was feeling over the top giddy until........After HOURS of trying to download the designs I found out my design software is not compatible with windows 8.1 GRRRRRR. Next week I will be headed to the quilt shop for assistance on a work around to get the stinkin hate it new PC in line with my sewing machine. It's always something. I was NOT going to be denied my play time, so I pulled out a Halloween ornament kit that was stashed away. Only three more ornaments to complete and this kit will be finished!! The grands are going to enjoy having a little something new to hang on their Mini Halloween trees this year. I am going to enjoy having one less thing piled up in the sewing room!!! Plans just never go as planned this year :) I am way past the point of letting it get to me (for the most part) I was scheduled to go away Thursday - Sunday this week for a scrapbooking retreat with a girlfriend, OK so that didn't happen. Kara and Blake have both been sick with chest colds, hubby is having to do some short quick trips lately, DD#1 is involved in a large fundraiser for Elijah, she too is sick and could use an extra hand and we are all very emotional over Elijah's condition. Home with our family is where I need to be right now. I went to my fall back place when I am a little upset...the kitchen :) Blake, Kara, and I made chocolate chip cookies for everyone. A few bags for friends, of course some for our big kids families in addition to a nice bag for Elijah and his family. When life gives me lemons baking, cooking, or doing something for someone else drives away those dark clouds.